When you receive your PCS the clock starts. You need to move soon and sell your current house even sooner. 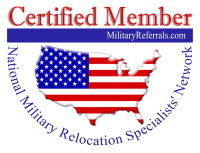 As a Military Relocation Professional (MRP), I understand your unique situation and have the knowledge to make the most of every transaction, selling and buying. My goal is to find a location and community quickly, so that you and your family can feel at home. Hello, I am your MRP.